DR. ROB ADAMS —IF YOU BUILD IT WILL THEY COME? Know if you'll hit your targets before pulling the trigger on any marketing plan. More than sixty five percent of new products are commercial failures, and if you compound this with a recession, now more than ever you can't afford to be wrong. In "If You Build It Will They Come, " business professor and strategy consultant Rob Adams shows you how to make sure you hit your target market "before" you spend a lot of money. He shows you the fast, systematic and proven approach of performing Market Validation in advance of making a large product investment. 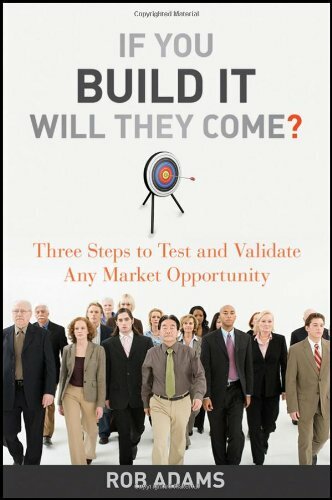 Adams outlines a simple and effective market validation and testing strategy that is proven, giving entrepreneurs and managers the ability to dramatically improve the prospect of product success. He explains how to quickly gather information on competitors, directly interview members of your target market, and figure out what the market really wants to buy, versus what customers say they want. The steps to quickly understanding the viability of your market Where to go to gather the information needed to hit the market requirements How to follow through with the right product launched in the right way Adams cuts through the fancy terms and expensive market research that gives lots of data but no real product oriented information about usage, pricing, features and competitive forces. In the end you'll produce results on your first release of a far more mature product, shipped in a faster timeframe with features customers will actually use. This book is for anyone involved with designing, developing and launching new products. Its examples and advice cover everything from the fledgling start-up that needs their first product to work just to survive to the successful Fortune Class company establishing new worldwide markets. Examples cut across all major industrial sectors including consumer, retail, manufacturing, technology, life sciences and services. This book offers the step-based guidance you need to make sure failure is not an option.